Whenever we serve salad at our cooking classes, invariably half (or more!) of the class participants ask me what is in the dressing: “What did you put in the dressing?? It is so delicious and so light!” This is such a familiar question that I finally realized it was time to write about it. 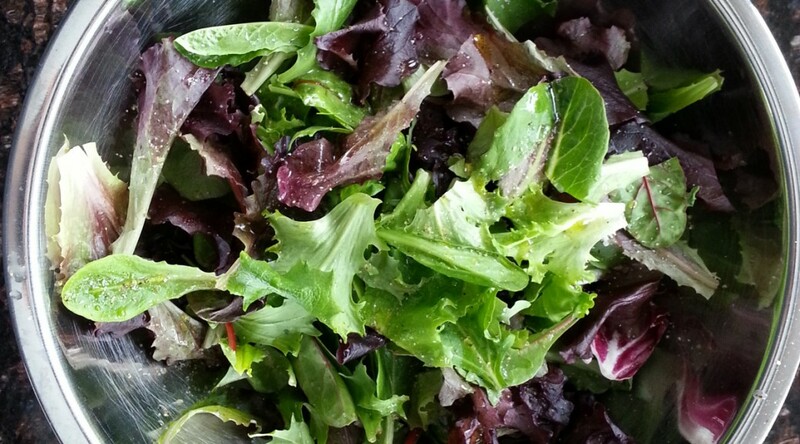 It is so very simple to make a good salad, but unfortunately most people don’t know how. Here goes. 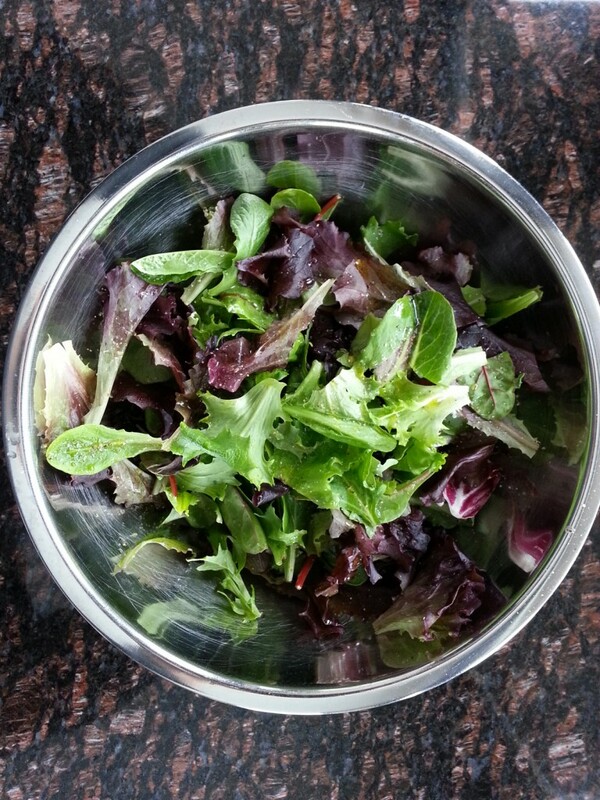 Start with the very best salad greens; they should be perky and firm and unblemished. I usually choose several varieties (for example, arugula, Boston lettuce, Romaine, oak leaf, and radicchio) so there are textural and color and flavor contrasts, making the salad more interesting. Wash the greens thoroughly and spin them dry. A little clinging water will water down the flavors of the salad, so DRY the greens well. If you are not using the greens right away, refrigerate them in a large bowl that will allow easy tossing later, wrapped in several layers of paper towel. When you are ready to serve, and no sooner than that, tear the greens (if needed) into bite-size pieces. Avoid cutting unless you are sure that your knife is very sharp. And here comes the most important part: Season amply with fine sea salt and give a gentle toss to coat well. Next, add the acid of your choice (most often, I use freshly squeezed lemon juice at home, or balsamic vinegar at the cooking school). Toss gently again to coat. Finally, pour in about twice to three times as much extra-virgin olive oil (the best you can afford) as the acid you used, and sprinkle with freshly ground black pepper. Toss gently again. Taste. Taste again. The salad should taste bright, lively, and full; if it is flat, add a touch more salt and toss gently again. Still flat? A bit more acid, and another gentle toss. Then onto plates right away before it wilts. Notice the repeated emphasis on the word “gentle.” Greens should be tossed delicately, to avoid bruising, and your hands are the best tool for this job. It is crucial to toss the salad in a very large bowl, also to avoid bruising the leaves. But the most important factor in achieving a salad with proper flavor and a light texture is to first season with salt, then with acid, and lastly, with fat. If you reverse the order in which you add the acid and fat, the fat will create a barrier that prevents the acid from coating the leaves, and the salad will be heavy as a result, lacking in brightness. And if you add salt after tossing with the fat and acid, the salt won’t flavor the greens as efficiently. Here is a general recipe to follow. Less is more when it comes to salad, so you taste the greens and feel refreshed after eating the salad; salad should not be drowning in dressing, it should just be coated lightly with as much acid and fat as needed to bring out its intrinsic flavors. Serve salad after the main course to cleanse the palate, the Italian way, or before the meal if you prefer it as a palate-teaser. Tear the greens into bite-sized pieces if needed into a very large bowl. Season with the salt and toss gently but thoroughly. Sprinkle with the lemon juice or vinegar and toss gently again. Pour on the olive oil, and toss gently again. Season with the pepper, and toss gently again. When all the leaves are evenly coated, taste, and adjust as needed. Serve within minutes.